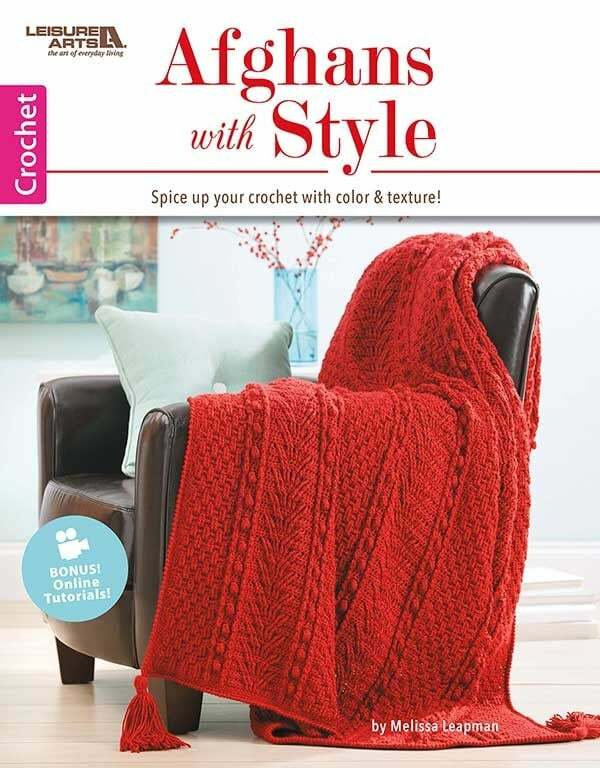 When you are ready to expand your basic crochet skills and tackle a new crochet technique – Afghans with Style should be on your list of books to purchase. 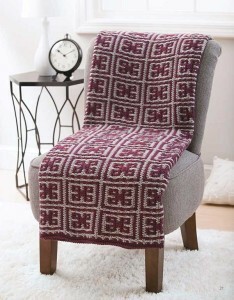 Afghans with Style contains written crochet patterns for six different throws using Fair Isle, Mosaic and Aran techniques. 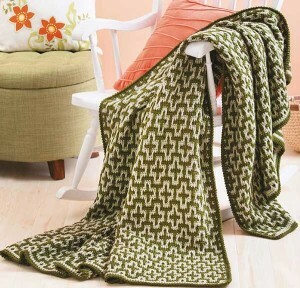 Mosaic Technique: this technique is used to create designs using only 2 colors of yarn. 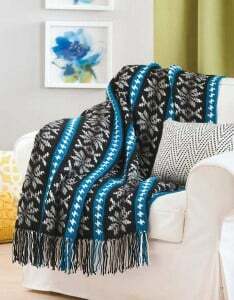 One color is worked for 2 consecutive rows and the second color is carried up the side until it is needed. The mosaic design is formed by working stitches and chain spaces with the first color of yarn and then by using the second color of yarn to work over top of the other stitches and into the chain spaces. The yarn floats (the unused yarn you carried up the side of the project) are hidden by enclosing them with the edging stitches at the very end of the project. 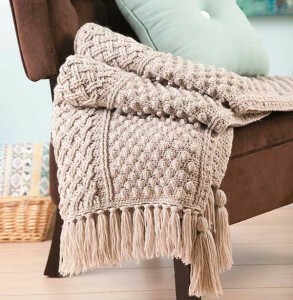 Aran Technique: this technique is created by using post stitches, popcorns and clusters. It creates a beautifully texture design. Fair Isle Technique: this technique is used to create designs in many colors. Each row only uses 2 colors. You will rotate which yarn color you are working with and the unused strand is worked over and hidden beneath. 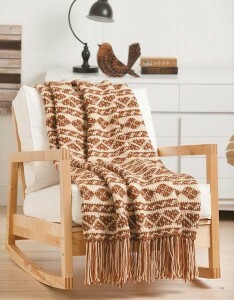 The blanket will have some thickness to it since you are always working over one strand of yarn. This publication includes the video camera icon throughout to notify you when there is a supportive video tutorial available for a skill or technique. Each pattern calls for medium weight yarn. My 2 favorite designs in Afghans with Style are Interlocked Mosaic and Hearthside Mosaic. Have you ever tried Mosaic, Fair Isle or Aran crochet techniques before? Would you like to win a eBook copy of Afghans with Style? I’d like to thank Leisure Arts, Inc. for providing me with the review copy of Afghans with Style and for the giveaway copy for my readers! I love learning new stitches. There are some very pretty patterns in this book! Lovely afghans and techniques to be incorporated into making lots of designs in this book! I love the afghans in this book! I love how you describe the different techniques, great job! Love these varied designs. Thanks for the review. This book is on my list to buy. I love learning new techniques. This book looks like it would be fun! I would love to know what you think know of the new charity crochet book. I really like this Afghan book. I have been crocheting for over 50 years and I love books that look like might learn something new from. this really looks like a great resource! 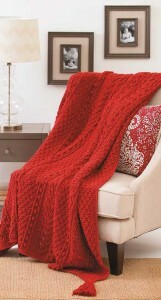 I love all crochet, especially shawls, afghans kitchen items and totes! Any book covering any of these would be great. Thank you for a fantastic blog. Love the Afghan book, Thanks for the giveaway! I love you collection of patterns and designs. I have made several of your patterns for family and friends. Beautiful Afghans. I can’t help it, I love them. And the used techniques.